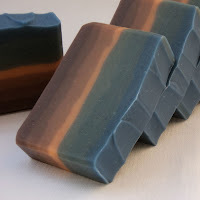 My soap for this month´s Challenge and I am very pleased with the result. 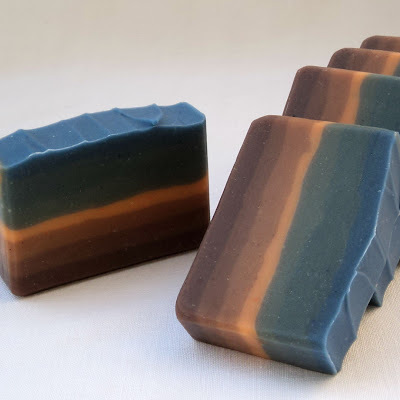 I´ve already tried one-colour gradient before, and last month I made a similar looking soap with botanical colours and clays - a combination of different brown and orange stripes, but not really in a gradient way. I like the colour mixing, it´s interesting to preview the shades and then to see how the colours influence each other in reality. 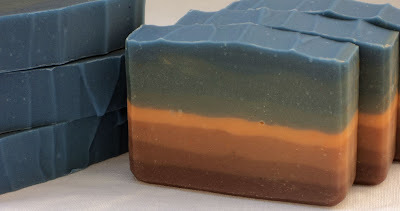 I wanted to make a brown - ocean blue/green (maybe greyish) soap with an orange accent. At first I planned to mix two gradients, the brown and the blue, and to make an orange line between them, but then I saw Amy´s tutorial and started thinking about using the orange as the middle colour. I thought the gradient might be more even like that and I also wanted to see what colour the blue and orange would make. So I decided to try it. I was expecting a nice shade of grey but the result is even better, a nice ocean green that I really like. I made the soap on Wednesday night. Smooth grounded scent of velvet Almond Milk and Vanilla with light sunny Mandarin and Lime. A creamy soap with buttermilk, oatmilk and white clay. 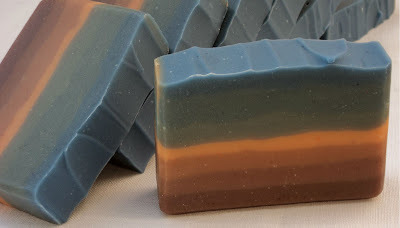 Last month I made this soap that I mentioned in the beginning, it´s a kind of gradient as well. For the colours I used different combinations/ratios of tomato puree, yoghurt, cocoa powder, turmeric and three clays - yellow, pink and red. 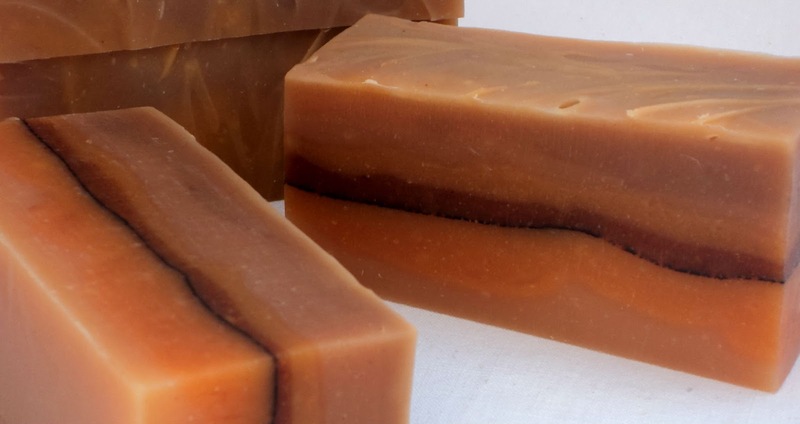 Desert Spice - manly soap scented with earthy Cedarwood, fresh citrus notes, eucalyptus and cinnamon. Now looking forward to see all the other soaps! It's gorgeous, Barbara! So perfectly done! So beautiful colors! The lines are so even and the earthy tones of all colors complement each other. I love your colors, what an awesome job! Beautiful colors! I especially love the blue-green. Very beautiful fall-like colors! Nice choice! Very even layers too - I'm impressed! I love this soap, the colors, and the gradient....awesome....my favorite! natural colors are lovely and you mastered it. great soap. Beautiful colors to match the season!